Diana Whitney, a graduate of Dartmouth College and Oxford University and a former Rhodes Scholar, is a mother, yoga instructor, poet, and blogger for The Huffington Post as well as author of Spilt Milk, a parenting blog. 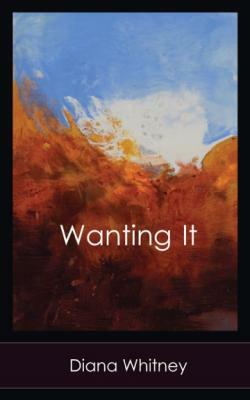 Whitney has recently published her first book of poems entitled Wanting It. This compilation, published in August 2014 by Harbor Mountain Press, bursts with imagery and honesty, reflecting one woman's experience living authentically. Whitney currently resides in Brattleboro, Vermont, where she teaches yoga. Gina Consolino-Barsotti: What inspired you to "give birth" to your poetry collection, Wanting It? Diana Whitney: Poetry has always been my first love, but I stopped writing poems after my first baby was born in 2005. I'm not sure exactly why—maybe because I was reeling from shock and grief. My dad had died suddenly of a heart attack at the end of my pregnancy, and then I suffered severe preeclampsia and went blind (temporarily) during labor, needing an emergency cesarean to save my life. As I recovered from that trauma, I hunkered down in The Baby Cave, that milky, dark nest of sleep-deprived mother-love. There was no space for poetry in this place. When my fiery second child was born less than two years later, she screamed for hours on end and the colicky infant-plus-toddler combination overwhelmed me, as it does so many mothers. All of my creative energy was channeled into my offspring, literally, through my milk, but also metaphorically. I started writing my online parenting column, Spilt Milk, when my girls were one and three. I found this short personal essay to be the ideal form for self-expression for about four years. It wasn't until I'd emerged from The Baby Cave—after Carmen (my youngest) had stopped nursing and was in preschool five mornings a week—that I returned to poetry. And I returned with a vengeance. In the spring of 2012, I was energized by other poets in my weekly writing group, who inspired me with their work and wanted to read mine. I felt alive and deeply engaged with language again. I wrote a slew of poems that spring and summer, and that winter I got out the draft of an incomplete poetry manuscript I'd started during my MFA at Warren-Wilson College. I worked with an editor to revise and sequence the manuscript, finally finishing in May of 2013. GCB: Your book, Wanting It, is dedicated to your mother "in memory" of your father. What do you mean by this? How did your mother help shape who you are as a woman, a mother, and a writer? DW: This is a great question. Nobody has asked me about that dedication yet. I always thought I would dedicate my first book to my dad, who died in 2005 right before Ava (my oldest) was born. He was a brilliant and accomplished man, an international development economist and college professor who wrote many academic books and displayed them all proudly on a book table in our front hallway. I've tried to imagine what he would think of Wanting It. … I hope he would be proud. My mother, on the other hand, devoted her entire life to raising a family. She was a fantastic reader who shared the joy of reading with her four children. From the time we were infants, she read us everything—Roald Dahl, Winnie-the-Pooh, Shel Silverstein, Tolkien. One of my happiest childhood memories is of her reading The Hobbit to us in our summer cabin in the woods of Maine. She was the most loving, supportive mother, and I used to bring her every story and poem I wrote as a child. I remember writing a sentimental ode to The Beatles when I was 13, something cringe-worthy about "being born into the magic twenty years too late." As soon as I finished it, I showed it to my mom and she hugged me and told me she loved it. She has always supported my creativity and believed in me. I feel lucky to have been raised with that steady encouragement. Dedicating the book to her felt especially poignant because she is now losing her memory, and so we are starting to lose her. GCB: Many of the poems in this work display a raw sensuality. As a mother, your sensuality as well as sexuality can often get repressed in the day-to-day caring for the kids. How did you get in touch with this sensuality when you were writing your poems amidst the chaos of child rearing? DW: I'm a Gemini and often feel I have a split personality—it's a struggle to integrate the disparate parts of my Self. Inside me exists the sensual poet-goddess who runs in the woods, channels the muse, and writes lyrics to an imaginary lover, and then there is the practical mother, ticking off her list: packing lunches, doing laundry, cooking pancakes. The practical mother does not write poems. I have to get out of domestic mode in order to write. Often this means literally leaving the house, going to a weekly writing group, or, if I'm lucky, going away once a year to a writing residency. Two-thirds of the poems in Wanting It were written before I had children. The rest of the book was written after my youngest was in preschool. But two things keep me in touch with the poet's sensuality in the midst of family chaos. The first is reading poetry, even a few poems before bed. When I need to remember I'm a writer, I return to my favorite poets: Jack Gilbert, Marie Howe, Laura Kasischke, W.B. Yeats, and many more. The second is keeping a notebook, jotting down lines, ideas, impressions, even things my kids say. Sometimes days (or even weeks) go by before I have the focus and concentration to link anything together, but I keep my finger on the pulse of poetry this way. GCB: In addition to writing poetry, you founded the yoga studio Core Flow Yoga and Sport and teach Ashtanga Yoga, where synchronizing the breath with the posture is key. How does this embrace the flow reflected in both your mothering and your writing processes? DW: Oh boy. I aspire to embrace the flow in my mothering, and I have my good moments. I try to savor the flow when I feel it, usually for just a few minutes at a time by dancing with my girls, swimming in the pond with them, or reading together at bedtime. But I don't have any magic yogic formula for being patient and calm in the midst of conflict. When my daughters are fighting, I can lose my temper fast and start yelling and issuing threats. And sometimes I so long for space from my kids that I get edgy and I simply cannot stay in the present moment. When I get worked up, I try to breathe deeply, and I try to share that practice with my daughters. Likewise, yoga is a backdrop for my writing, but not an active part of my process. The two practices permeate each other on an energetic level, but it's not like I roll out my mat and do Ashtanga and then open my journal and write a poem. Finding a flow state while writing is an incredible experience. It doesn't come easily for me—if I feel at all constrained by time or the threat of interruption by my kids, it won't happen. I often have to trick myself into it by acting lazy and relaxed, lying on the couch with my notebook and a cup of tea and some books of poems, not actually planning to write anything. This is when an image or a memory or a few first lines appear, and I drop into the flow of a poem or essay. I'm still discovering how my writing process works. GCB: Can you comment on the poetic voice behind poems such as "Peckerville" and "Watched Pot"? How did you develop the courage to speak so openly? DW: Thank you for calling those poems courageous! It's funny, I don't think of writing "Peckerville" as brave, but rather as an act of self-mythology that relies mostly, as you say, on "voice." I created a character in "Peckerville"—the "I" or "eye" of the story—who embodied an exaggerated aspect of myself. In some ways, she was a response to the gossip I knew my neighbors were sharing about me after I moved to an old farmhouse in Vermont's Northeast Kingdom—in a town that was really just a dirt crossroads, a scattering of houses, and a dairy farm. I lived there in my late twenties with a few artsy young women, and we put in a wood-fired hot tub and threw incredible theme parties. Most of the earlier poems in Wanting It were written up there in the Kingdom, as its called, a remote, lonely, and devastatingly beautiful corner of Vermont that nurtured and inspired my writing. "Watched Pot" comes out of the immense solitude I felt at that time, when I was single and full of longing for the next experience. All around me people were having babies and there I was, alone, both cherishing my wild independence and feeling impatient for a partner and my fantasy of a baby. Now I laugh at the naïveté of this poem, since at the time I wrote it I had no idea what it meant to be pregnant. I could only watch the expecting woman and idealize her as some kind of fertility goddess: "She's like the great cloud of apple blossom / Wreathing the treetops, too radiant, too much / Life under skin." What I love about poetry is how it can illuminate a single lyric moment, calling to mind one party in May when I was 26. While I've forgotten the details of most of the Kingdom parties, I will always remember the image of this beautiful pregnant woman dancing and the hunger I felt for the unknown ahead of me. GCB: Of all the poems in this book, which one really pushed you to grow in various aspects of your life and why? DW: The poem "Outer Heron" is about marriage and forgiveness, and evokes one of the central struggles of the book, which is how to navigate this world as a passionate woman, full of longing: "and I sobbed / forgive me for my hunger." I’ve often felt I needed to apologize for my hungers, not only to my husband, but also to family, friends, and to society in general. Writing this poem represented a kind of healing. Additionally, it was an acknowledgment of the complicated nature of love, the beauty and blessings of my family, and the undercurrent of desire that persists. "Outer Heron" is a love poem, but a restless one. It yearns for magic and transformation, a journey to a wild uninhabited island, far beyond the domestic realm. GCB: What other poetic or prosaic endeavors are you currently working on? DW: Right now, I'm shopping around for a publisher for Spilt Milk: Making a Mess of Motherhood. This memoir-in-essay weaves the best of my parenting column with some new nonfiction. Fingers crossed, it will find a publisher in 2015. I'm also blogging for The Huffington Post on topics such as mothers, daughters, sexuality, identity, parenting, and desire. (I pray my girls will forgive me someday since these pieces are slightly risky.) Additionally, I'm writing new poems and generating material for a second collection that will appear somewhere down the line, if I'm lucky.